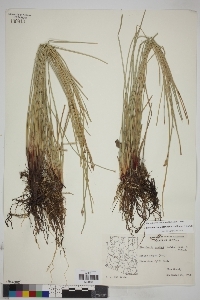 Plants perennial, densely tufted or mat-forming; rhizomes mostly hidden by culms and roots, fairly long, 3 mm thick, hard, cortex persistent, longer internodes to 3 mm, scales persistent, ca. 8 mm, membranous, slightly fibrous. 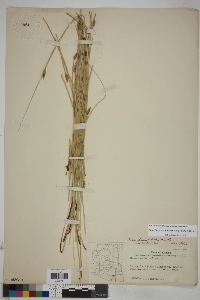 Culms terete, when dry with few to many blunt ridges, 10-70 cm × 0.5-2 mm, soft to firm, internally hollow with complete transverse septa 2-5 mm apart, usually evident externally except in narrowest culms. Leaves: distal leaf sheaths persistent, not splitting, proximally dark red, distally green or brown, slightly callose, papery, apex obtuse, tooth present, 0.3-1 mm. Spikelets ovoid, 6-21 × 3-4 mm, apex acute to obtuse; proximal scale amplexicaulous, entire; subproximal scale empty or with flower; floral scales appressed in fruit, 100-500+, (15-)30-40 per mm of rachilla, medium brown to colorless, midrib regions greenish to colorless, ovate, 1.5-2.5 × 1-1.5 mm, entire, apex rounded to subacute, carinate in distal part of spikelet. 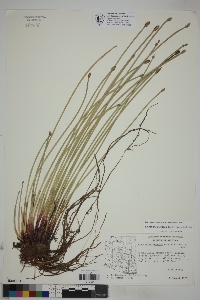 Flowers: perianth bristles 6-8, pale brown, medium stout, from less than 1/2 achene length to sometimes slightly exceeding tubercle, retrorsely spinulose; stamens 1; anthers dark yellow to brown, 0.6-1 mm; styles 3-fid or some 2-fid. Achenes falling with scales, dark green or medium brown, obovoid to obpyriform, biconvex or sometimes some compressed trigonous in same spikelet, lateral angles prominent, abaxial angle absent or evident, not prominent, 0.8-1.1 × 0.7-0.8 mm, neck short or absent, finely cancellate at 10-20X, sometimes finely rugulose, with 15 horizontal ridges in vertical series. Tubercles brown, pyramidal, mostly depressed, 0.2-0.35 × 0.2-0.4 mm. Fruiting winter-fall. Fresh temporary or artificial ponds, ditches, burned savannas, swamp margins; 20-90[-2800] m; Ala., Ariz., Fla., Ga., La., Tex. ; Mexico; West Indies; Central America; South America. 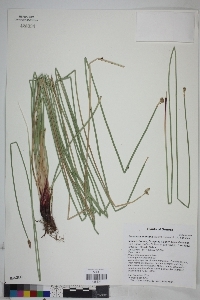 The taxonomy of the septate-culmed species here treated as Eleocharis montana and E. ravenelii should be evaluated. According to H. K. Svenson (1957), the type of E. montana from near Bogotá, Colombia, is the mountain extreme of the species; it has swollen culms with no visible septation. 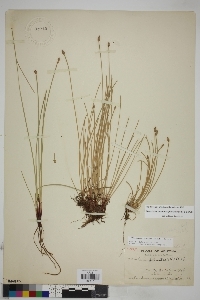 Specimens from Acadia and St. Landry parishes, Louisiana, are intermediate between Eleocharis montana and E. montevidensis.